For many Japanese, it goes without saying that worshipping at a Buddhist temple on any given day brings one merit. Some days, however, are special. In fact, according to tradition, tomorrow, July 10, is VERY SPECIAL INDEED, as dropping in at the Asakusa Kannon will be equivalent to 46,000 regular day visits! This sounds-too-good-to-be-true offer gets even better. From early in the morning to about midnight, hundreds of small stalls will be set up selling hozuki and wind chimes, two classic symbols of July in Japan. Hozuki are delicate, almost translucent, orange pods, which are reminiscent of half-deflated origami balloons. They have traditionally been used as decorations, toys and laxatives! The hozuki market is held in Asakusa because sometime in the 18th century a certain samurai’s attendant is said to have dreamed of the plant’s curative powers which were later confirmed by the amazed local residents. The market has been held ever since, for more than 200 years. Many older women I have spoken to in Tsukuba can remember painstakingly removing the seeds from the delicate pods as children to make toy noise makers which were blown into — something kids today probably don’t have the patience or desire to do! The beautiful hozuki plants, the excitement in the air, and the cool tingling of countless wind-chimes makes for a perfect summer excursion — and you can get yourself PLENTY of merit to boot! Alas, tomorrow is a weekday. But for those who can’t make it to Asakusa’s Sensoji, a final look can be had at the beautiful hozuki arrangement in the lobby of the Okura Hotel at Tsukuba Center. 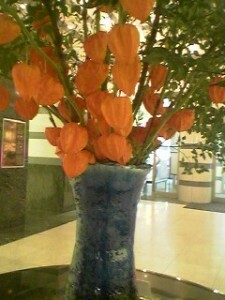 The lobby flowers are changed every Thursday at the Okura, so you had better get there early. I’ve been going EVERY DAY! In contrast to the always tasteful floral inventions which can be encountered at the hotel, the managers of the Tsukuba Center Complex have put up a tacky display of poster-sized photos, cheaply framed, of VIPs who have visited the center over the past 20 years. You might imagine that these would be shots of great scientists or scholars, as many have been through Tsukuba over the years. The organizers of this particular display, however, have selected only pictures of royalty: the Showa Emperor, the current Emperor and his wife as Crown Prince and Princess, the Kings of Belgium and Sweden, the Princess of Thailand, Margaret Thatcher, etc. Seems a bit out of touch with what Tsukuba is supposed to be about, but these unartfully hung posters can’t help help but make one stop a moment, have a look at each one and wonder where all the time goes.